We have been getting great reviews after adding this latest product from Baby-Vac. Designed by an award-winning scientist, the Baby-Vac™ Nasal Aspirator effectively and safely removes mucus from the nasal cavity in an efficient and gentle manner. The Baby-Vac™ has been clinically tested and approved. It is recommended by pediatricians and ENT specialists from around the world. The removal of secretion from the nasal cavities will help in recovery in case of sickness, and improve breathing. One of the major issues is that babies and small children are not able to blow their nose and it will take some time before they learn to breathe through their mouth. A stuffy nose will hinder breathing, can cause discomfort, and may lead to more serious health problems concerning the ear, nose, throat and the inferior respiratory tracts. Therefore it is very important to keep the nasal cavity clear. 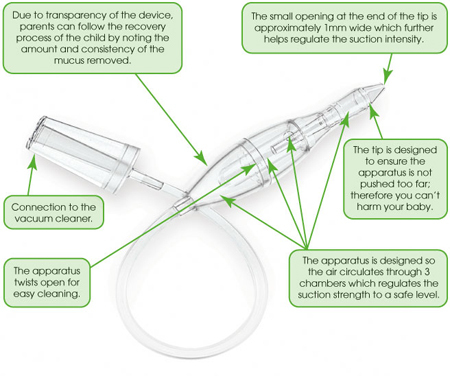 The Baby-Vac™ Nasal Aspirator is by far the best alternative for this purpose.